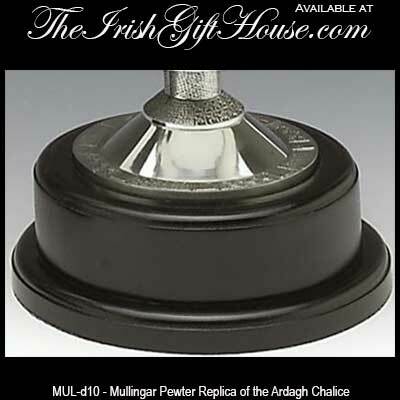 This replica of the Ardagh Chalice is from Mullingar Pewter and stands 10” tall with the wooden base. This pewter chalice would make an excellent trophy. 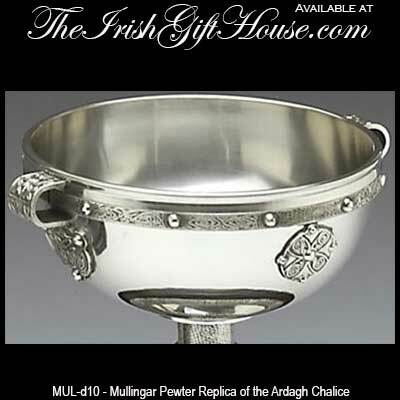 The Ardagh Chalice, which ranks with the Book of Kells as one of the finest known works of Celtic art, is thought to have been made in the 9th century AD. It was found in 1868, together with a small bronze cup and four brooches, by two boys, Jim Quin and Paddy Flanagan, digging in a potato field on the south-western side of a rath (ring fort) called Reerasta, beside the village of Ardagh, County Limerick, Ireland. 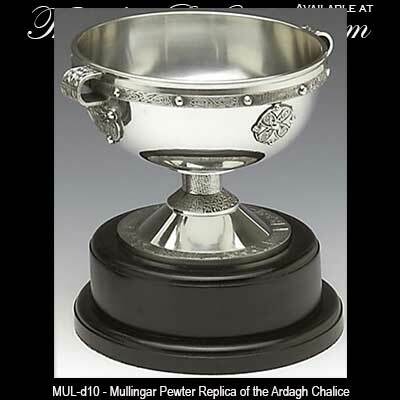 The Ardagh Chalice currently resides in the National Museum of Ireland.